With the recent formation of Mega Nova, the Santana-led supergroup provided an opportunity for Wayne Shorter and Herbie Hancock to work together again. The two have been musicians for decades, and friends for a majority of their lengthy, prolific careers. Starting with roles in Miles Davis’ Second Great Quintet, the two are true innovators. If you enjoyed this, check out their interview in National Geographic! I'm always looking for inspiration - ALWAYS!!! So why not from a rock star or from a tattoo artist (more on that in another post)! And yes, I'm on a roll. 2 posts in 2 days! Am I inspired or what?! Remember when you first started your instrument?? Was it hard? Did you know what to do with it? How to play it? Where do you blow? Where do you put your fingers? When learning new skills, new music, new everything remember it wasn't easy to start in the first place so keep at it as you will get it with work. Famed flutist said it best, "If it's worth doing it's worth doing well." Hi all! It has been awhile. Nothing like the busy-ness of Spring! Here is a wonderful article about nurturing our children in anything they do, not only in music. Enjoy! Five Ways to Nurture Talent (Without Being a Psyco Parent), by Daniel Coyle. He has a wonderful book out called, "The Little Book of Talent." In the last few decades, talent-nurturing has been transformed into the equivalent of anIron Chef competition, in which parents frantically assemble ingredients while the clock ominously ticks. Tiger Mothers and Fathers stalk the landscape, carrying their superstar cubs in their mouths. Soccer, violin, chess, math, art, academics -- they're not activities so much as readymade funnels down which you can pour massive amounts of time, money, and anxiety. All of which adds up to a question: is there a wiser way to navigate this world? It's the sort of question Arianna Huffington addresses in the pages of her new book Thrive: The Third Metric to Redefining Success and Creating a Life of Well-Being, Wisdom, and Wonder(which is terrific, by the way). Thumbs up to practice (and Rock and Roll and to learning to ride a bike)! This really reminds me that learning is so much fun and continuous. How cool it is to see such excitement! What a great feeling to see others get that excited or even to experience it yourself! ...a little YouTube addendum to the previous blog (see below). Enjoy the music. AND remember musicians can be Astronauts that perform duets with Rock Stars from space to earth! HAPPY 2014 and HAPPY PRACTICING!! I ran across this great article and hope you enjoy it. Definitely an easy blog for me so more from me later. *There are many famous people that studied music that Ms. Lipman does not mention in this article. Albert Einstein is one - he studied violin and piano and enjoyed playing through out his entire life! Will your school music program turn your kid into a Paul Allen, the billionaire co-founder of Microsoft (guitar)? Or a Woody Allen (clarinet)? Probably not. These are singular achievers. But the way these and other visionaries I spoke to process music is intriguing. As is the way many of them apply music's lessons of focus and discipline into new ways of thinking and communicating - even problem solving. Look carefully and you'll find musicians at the top of almost any industry. Woody Allen performs weekly with a jazz band. The television broadcaster Paula Zahn (cello) and the NBC chief White House correspondent Chuck Todd (French horn) attended college on music scholarships; NBC's Andrea Mitchell trained to become a professional violinist. Both Microsoft's Mr. Allen and the venture capitalist Roger McNamee have rock bands. Larry Page, a co-founder of Google, played saxophone in high school. Steven Spielberg is a clarinetist and son of a pianist. The former World Bank president James D. Wolfensohn has played cello at Carnegie Hall. "It's not a coincidence," says Mr. Greenspan, who gave up jazz clarinet but still dabbles at the baby grand in his living room. "I can tell you as a statistician, the probability that that is mere chance is extremely small." The cautious former Fed chief adds, "That's all that you can judge about the facts. The crucial question is: why does that connection exist?" Paul Allen offers an answer. He says music "reinforces your confidence in the ability to create." Mr. Allen began playing the violin at age 7 and switched to the guitar as a teenager. Even in the early days of Microsoft, he would pick up his guitar at the end of marathon days of programming. The music was the emotional analog to his day job, with each channeling a different type of creative impulse. In both, he says, "something is pushing you to look beyond what currently exists and express yourself in a new way." Mr. Todd says there is a connection between years of practice and competition and what he calls the "drive for perfection." The veteran advertising executive Steve Hayden credits his background as a cellist for his most famous work, the Apple "1984" commercial depicting rebellion against a dictator. "I was thinking of Stravinsky when I came up with that idea," he says. He adds that his cello performance background helps him work collaboratively: "Ensemble playing trains you, quite literally, to play well with others, to know when to solo and when to follow." For many of the high achievers I spoke with, music functions as a "hidden language," as Mr. Wolfensohn calls it, one that enhances the ability to connect disparate or even contradictory ideas. When he ran the World Bank, Mr. Wolfensohn traveled to more than 100 countries, often taking in local performances (and occasionally joining in on a borrowed cello), which helped him understand "the culture of people, as distinct from their balance sheet." It's in that context that the much-discussed connection between math and music resonates most. Both are at heart modes of expression. Bruce Kovner, the founder of the hedge fund Caxton Associates and chairman of the board of Juilliard, says he sees similarities between his piano playing and investing strategy; as he says, both "relate to pattern recognition, and some people extend these paradigms across different senses." Mr. Kovner and the concert pianist Robert Taub both describe a sort of synesthesia - they perceive patterns in a three-dimensional way. Mr. Taub, who gained fame for his Beethoven recordings and has since founded a music software company, MuseAmi, says that when he performs, he can "visualize all of the notes and their interrelationships," a skill that translates intellectually into making "multiple connections in multiple spheres." For others I spoke to, their passion for music is more notable than their talent. Woody Allen told me bluntly, "I'm not an accomplished musician. I get total traction from the fact that I'm in movies." Mr. Allen sees music as a diversion, unconnected to his day job. He likens himself to "a weekend tennis player who comes in once a week to play. I don't have a particularly good ear at all or a particularly good sense of timing. In comedy, I've got a good instinct for rhythm. In music, I don't, really." 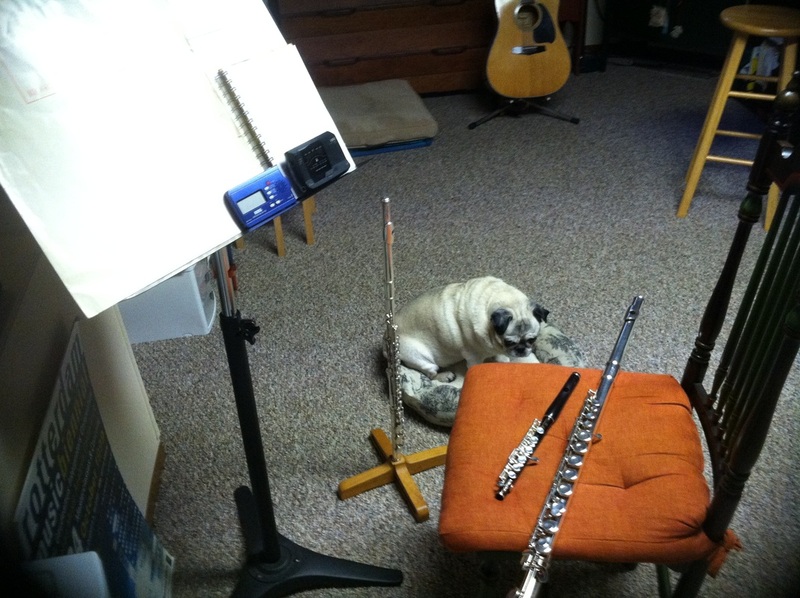 Still, he practices the clarinet at least half an hour every day, because wind players will lose their embouchure (mouth position) if they don't: "If you want to play at all you have to practice. I have to practice every single day to be as bad as I am." He performs regularly, even touring internationally with his New Orleans jazz band. "I never thought I would be playing in concert halls of the world to 5,000, 6,000 people," he says. "I will say, quite unexpectedly, it enriched my life tremendously." Music provides balance, explains Mr. Wolfensohn, who began cello lessons as an adult. "You aren't trying to win any races or be the leader of this or the leader of that. You're enjoying it because of the satisfaction and joy you get out of music, which is totally unrelated to your professional status." For Roger McNamee, whose Elevation Partners is perhaps best known for its early investment in Facebook, "music and technology have converged," he says. He became expert on Facebook by using it to promote his band, Moonalice, and now is focusing on video by live-streaming its concerts. He says musicians and top professionals share "the almost desperate need to dive deep." This capacity to obsess seems to unite top performers in music and other fields. Ms. Zahn remembers spending up to four hours a day "holed up in cramped practice rooms trying to master a phrase" on her cello. Mr. Todd, now 41, recounted in detail the solo audition at age 17 when he got the second-highest mark rather than the highest mark - though he still was principal horn in Florida's All-State Orchestra. "I've always believed the reason I've gotten ahead is by outworking other people," he says. It's a skill learned by "playing that solo one more time, working on that one little section one more time," and it translates into "working on something over and over again, or double-checking or triple-checking." He adds, "There's nothing like music to teach you that eventually if you work hard enough, it does get better. You see the results." That's an observation worth remembering at a time when music as a serious pursuit - and music education - is in decline in this country. Consider the qualities these high achievers say music has sharpened: collaboration, creativity, discipline and the capacity to reconcile conflicting ideas. All are qualities notably absent from public life. Music may not make you a genius, or rich, or even a better person. But it helps train you to think differently, to process different points of view - and most important, to take pleasure in listening. Joanne Lipman is a co-author, with Melanie Kupchynsky, of the book "Strings Attached: One Tough Teacher and the Gift of Great Expectations." I am always trying to look for ways to make practicing fun for my students (and myself - sometimes at least). As famed music educator, Dr. Shinichi Suzuki wrote, "If there is no fun there is no learning". Don't get me wrong, practicing is usually a serious matter as it needs to be done in order to get better - but why not find ways to make it fun. So I wanted to tell you about some fun gadgets and tools that can perhaps help make practice a bit more interesting. First, there are specific tools that are absolutely necessary for a good practice session. 1. A room or area in your home where there are few distractions. 3. Straight Chair - unless the student is standing. By the way, posture is very important! It is a given for us wind players as we need optimum lung power but also for string players, percussionists and pianists. Having good posture and position give us the best facility for our fingers and arms. We were made to be upright and that gives our bodies the maximum energy needed to play at our utmost ability. *these items can be purchased at an area music shop or online. Now just add the instrument and these necessary tools can make music making fun for sure but we can definitely find more to shake up the practice session a bit. -Highlighter Tape - colorful highlighter tape that is removable. A great way to mark certain sections of the music that needs more attention. Comes in fun colors and can be purchased from office supply or educational supply stores. Programs/apps for your various devices! -Cleartune ($3.99) - A very accurate tuner, includes settings for various instruments. -Metronome PrO ($2.99) - there are many metronome apps out there but this seems to produce a loud and clear sound, includes many predefined rhythms and beat pattern options, and you can create and store rhythm. -*Super Metronome Grovebox (FREE - though see below) - metronome with a beat! -**Super Metronome Grovebox Pro ($3.99) - spend the money to get the most grooves! -Garage Band ($4.99) - record a performance, then manipulate the sounds, or have a jam session with yourself by adding layers of your playing. -Voice Memo - to record practicing. What fun to hear how you sound. Students can be their best teacher by listening to themselves. -YouTube - wealth of performance and teaching videos. I recently happened to find 2 of the 3 band pieces that my daughter was working on in band. An awesome tool to see what you look like playing. It can be a complete eyeopener! I had never seen myself perform until I was receiving my Bachelors in performance. I found out that I swayed so much when I played that I looked like I was going to topple over! Boy did I change things fast and it actually really helped my playing aside from helping me to not look totally ridiculous! -NMML (Naxos Music Library)/NJL (Naxos Jazz Library) (Free) - Mobile access to two of the LIbrary's streaming music databases. Well, I hope you find some of these gadgets useful and fun. I know there are many more out there that you all might find helpful. Basically being creative in the process of practicing can do wonders. Let me know if you find useful tools as I am always looking for more. My practice space complete with one of my biggest fans, Harley. This blog is intended for students, parents and young musicians who would like some ideas to help with practicing their instrument. I will include what I believe are useful articles and some ideas I have found to help with practicing. One thing I try to always remember when practicing is to enjoy the music and make it come to life! a great article for the start of the school! I’m seeing photos pop up on Facebook and Instagram of my friends’ children ready for their first day of school–backpacks on, fresh new outfits, big smiles. And while these courageous kids may be a little nervous to tackle a new year, it’s often the parents who feel more overwhelmed when school starts up again. There is so much to worry about: filling out registration forms, buying new school clothes, sizing up that endless list of school supplies, getting everyone fed and dressed in the morning, meeting with the PTA, getting to know your child’s teacher, hoping your child has good friends and stays out of trouble . . . it’s enough to make you want to just sit still at a desk for a few hours while someone lectures you about the Civil War. And then there’s homework. Before you know it, the dining table is buried in notebooks and papers and textbooks and (these days) a laptop or two. And somewhere, underneath a pile of backpacks and sports equipment you might find your child’s violin. For children in school music ensembles, there’s yet another somewhat-intangible task that needs to be accomplished between all that homework: PRACTICE. Because not all music teachers require their students to keep a practice log that will be graded, the expectations to practice are vague for most studens who don’t know how much, how often, or simply when to practice during the school week. As a parent, you want your child to succeed in both academics and extracurriculars, but finding a balance can be a real challenge. So when your child is stressing out about a book report due on Friday, is it possible to step away from Bronte to spend some time with Brahms? Does practice interrupt study time, or does study time interrupt practice? 1. Homework and practice are both important. Neither are superior to the other; rather, they complement each other. If you want your child to take music seriously, emphasize how important practice is to becoming a great musician. Likewise, your child’s love for music shouldn’t keep them playing Rock Band for hours on end when there’s a huge exam coming up. Balance is key (see below). 2. There IS time to practice during the week. Hard to believe? Yes. Impossible? No. Scheduling and setting aside time for both homework and practice is key. For elementary students, even ten minutes of focused practice every day is a huge accomplishment! Older high school students serious about their musicianship might commit to practicing an hour+ per day. Maybe practicing every other day works better for your child. But no matter what the goal is as far as how much time to spend practicing, the key is consistency and regularity. Practicing doesn’t have to be a huge undertaking. Just carve out a slot of time in the morning, while dinner is cooking, right after school, or whatever works for you and your child. 3. Establish a place to study and a place to practice. Most students have a study space at home, whether at a desk in their room or at a table or in an office. Similarly, designate a place to practice. It could be a room or simply a corner somewhere where there is already a music stand set out, a metronome at hand, a shelf for music, a storage spot for the instrument, and decent lighting. So when you say, “Hey, Johnny, it’s time to practice!” he knows exactly where to go to make it happen. 4. Being well-rounded is a good thing. Academics, arts and music, and sports/physical fitness are all wonderful and each require discipline. Encourage your child to embrace both academics and practice as exercises for different parts of the brain. Music sharpens the mind and will likely help your child do better academically as a direct result of learning an instrument. 5. Practice can be seen as a nice break from time at the desk. When you notice your child’s eyes glazed over and drool trickling down onto George Washington’s face in the history textbook, try for a change of pace. Doing something physical like standing up to play an instrument is so invigorating after reading or writing for too long. Practice can be actually be really relaxing and rejuvinating when the brain is otherwise fried. 6. Homework can be a nice break from time at the music stand. 7. Practice can be fun. Mix things up. Keep the act of both practice and study far from grueling. Keep a positive attitude about practice by talking about practice as if it is (and because it totally can be) an enjoyable activity and something fun to do. Talk about the instrument as something special and worth respect. Avoid treating practice as a form of punishment or your child will begin to view practicing and eating slimy green vegetables as similar forms of torture. 8. Practice is a form of homework. If practice is seen as an optional activity, it may never happen. Treat practice like an assignment, as something that must be accomplished. 9. Family time is essential. Doing homework and practicing don’t have to draw away from positive family relationships and time together. Try practicing with your child. Ask them (in a positive, inviting way) to play what they’re learning for you or to perform for the family. And when it’s time to hit the books, try sitting down to study with your child by helping them with their assignments or simply sitting next to them while you do your own reading, study, or work. Being present is a simple way to be supportive. 10. Don’t take anything too seriously. Keep calm. Don’t panic. Everything is going to be just fine. I've always been interested in practicing. How to get the best results. I have never wanted to practice for hours on end - I have way too much to do (want to do, rather do, need to do, etc.). I hope these posts give some good ideas on ways to make practicing easier, if not fun and inspiring.